So your wife/girlfriend/partner is pregnant. Congratulations! Now what? Who’s Your Daddy is the iPhone app for first-time dads (and mums). 290 daily tips telling you what to do and what not to do during pregnancy. A timeline with all the key dates that you can add to your calendar. 42 personalised weekly updates for you, your partner and your baby. Helpful tools like a contraction counter, a hospital bag checklist, to-do-list and potential baby name list. 290 humorous and informative tips which will give you 9 months peace of mind for the price of a small beer. 42 weekly updates to make the life of an expecting dad easier by giving him a heads up on what to expect during pregnancy. A veritable smorgasbord of tools including a hospital bag checklist with some suggested items, a baby stuff to do list, a baby name collector and a contraction counter that you will never use. 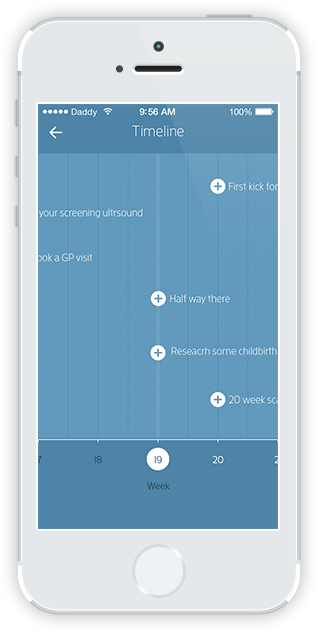 "When my wife became pregnant, I realised how little I knew…This app is a godsend. It’s not a medical journal, it’s more like a knowledgeable mate that has been through it all. It makes you look good and takes the stress out of some situations. Got a little on on the way - get this app"
"This app connects the dots for you having done a lot of the research for you… In other words it makes you look awesome." Written for men by men (with advice from midwives), this app guides first time dads through their pregnancy with simple daily tips and weekly updates. Nine months peace of mind for the price of a small beer, with useful “there’s a baby coming” coping mechanisms such as daily tips, weekly updates and lots of lists. Who’s Your Daddy? is designed to make the lives of expecting dads easier by giving him a heads up on what to do and not to do during pregnancy with fully-personalised content.